Study Guide to Accompany Basics for Chemistry is an 18-chapter text designed to be used with Basics for Chemistry textbook. Each chapter contains Overview, Topical Outline, Skills, and Common Mistakes, which are all keyed to the textbook for easy cross reference. 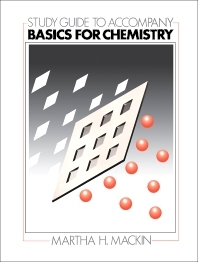 The Overview section summarizes the content of the chapter and includes a comprehensive listing of terms, a summary of general concepts, and a list of numerical exercises, while the Topical Outline provides the subtopic heads that carry the corresponding chapter and section numbers as they appear in the textbook. The Fill-in, Multiple Choice are two sets of questions that include every concept and numerical exercise introduced in the chapter and the Skills section provides developed exercises to apply the new concepts in the chapter to particular examples. The Common Mistakes section is designed to help avoid some of the errors that students make in their effort to learn chemistry, while the Practical Test section includes matching and multiple choice questions that comprehensively cover almost every concept and numerical problem in the chapter. After briefly dealing with an overview of chemistry, this book goes on exploring the concept of matter, energy, measurement, problem solving, atom, periodic table, and chemical bonding. These topics are followed by discussions on writing names and formulas of compounds; chemical formulas and the mole; chemical reactions; calculations based on equations; gases; and the properties of a liquid. The remaining chapters examine the solutions; acids; bases; salts; oxidation-reduction reactions; electrochemistry; chemical kinetics and equilibrium; and nuclear, organic, and biological chemistry. This study guide will be of great value to chemistry teachers and students.